I have noticed that sinking in Indonesia always seems to happen at night, suddenly in the middle of the night. And for St Vincent in the Caribbean this also was reported in the middle of the night. Is there a relationship between plate movements and where the globe is during the 24 hour period? [and from another] Note for 3 days in a row, the Virgin Islands had a quake at the same hour! In 2003, when Planet X had first entered into the solar system, a twice a day tug on the Earth was noticed at the 0:00 UTC and 12:00 UTC points, midnight and noon for Greenwich. This was due to Planet X grabbing the highly magnetized Atlantic Rift, which acts as a surface magnet, when it faced Planet X and the Sun or was in opposition on the dark side of Earth at night. Now that Planet X has swung in place to point its N Pole toward the Earth, the daily Earth wobble has changed to be a polar wobble, a violent push away of the Earth's N Pole when it comes up over the horizon to face the Sun and Planet X. Nevertheless, the tug on the Atlantic Rift is still there. Note that 3 am UTC places the Atlantic Rift on an approach to the dark side, and that the S American Plate is just behind in this approach. In that Planet X is slightly to the right of the Sun, this would put it in line to tug the Atlantic Rift and the S American Plate at this time. What does such a tug do? The whole compression of the Pacific is due to this tug, at base. The core of the Earth wants to continue to pull east, in its rotation, while the Atlantic Rift is held back. This pulls the S American Plate backwards at the Equator, so that S America tries to roll over the Caribbean Plate, and tends to push the Andes over the Nazca Plate. All this forces the Americas to push the Pacific Plate west also, thus the pileup in Asia. At 12:00 UTC (when Asia is asleep) or 0:00 UTC (when the Caribbean is asleep) there is a tug, and at 6:00 UTC the magnetic N Pole of Earth rises over the horizon to face Planet X for a violent shove. This destabilizes the gripping rock fingers holding the Earth plates, thus causing plate movement. For Asia or the Caribbean, when sudden sinking happens in the middle of the night, this is so distressing, unnerving, that it gets mentioned in the press. No one wants to awake to find themselves drowning. You have addressed the accordion press from the side for Indonesia, where land strips heave while others nearby sink. This showed up early in the process, when Bangkok sank somewhat but a small island near Bali rose out of the sea. Does a heaving and sinking process also occur when the plate is under stress, and plate movement happening? For instance, does a given area sink under the pressure, then rise again somewhat? Like being dunked like a tea bag to some degree, while slowly sinking. The twinning of quakes, whereby within minutes a second quake of almost equal force strikes an area in Indonesia or the Caribbean or in S America, has been noted by those following the quake patterns. Nancy has likewise noted a pattern in the sinking in both regions whereby a backwash from the rivers occurs, then subsides, then occurs again later, almost as though the sinking is repetitive, each time worse, each time with more ground lost. Is such a thing happening, and if so, what would be the cause? As the globe turns, the momentary pressure from a grab by Planet X on the Atlantic Rift will ease. This is likewise true of the violent push against the Earth's magnetic N Pole. Note that the twinning occurs most often when the Atlantic Rift is facing Planet X (12:00 UTC) or in opposition (0:00 UTC), or when the Earth's magnetic N Pole comes up over the horizon to face Planet X (6-8:00 UTC). When under pressure, the areas that are sinking are pushed down, but as the pressure eases some of that loss of elevation is retrieved. A dunking process, as Nancy said, like a tea bag in a cup of tea, each time lingering longer in the water, each time more water soaked, and each time remaining thus more under water. If S America is going to move 250 miles to the west, the top portion moving that, then during the 7 of 10 when S America moves before the New Madrid adjusts, does this mean that Panama is going to be shoved way to the west while Mexico stays where it is? Or is the 250 mile movement the final result at the end of the 7 of 10 process? How far does Mexico, the tip of Mexico move during the New Madrid adjustment? We stated that as a result of the 7 of 10 scenarios that the top of S America would find itself 250 miles further to the west, though not all of this would be due to movement of S America and the Caribbean and Central America. Can we be more specific? We have described the Pacific Plate as being composed of four plates, not one. They are folding over one another, and thus the Pacific compresses. It is primarily the folding of the Mariana Trench with the tilting of the Mariana and Philippine plates that create a significant reduction in the size of the Pacific to allow the S America roll to occur. There will be great coordination of these events during the final sinking in Indonesia and significant rolling of the S America Plate. What happens to Mexico during this process? Is it left where it is, to find its connection with Central America 250 miles further to the west? 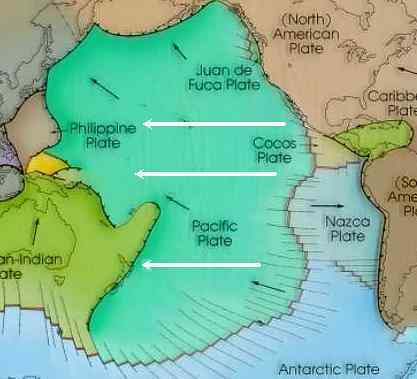 When the Mariana and Philippine plates tilt and fold this affects Mexico, which is directly to the east. This portion of the N American continent moves in concert with the S American roll, putting the N American continent under an excruciating bow stress prior to its anticipated New Madrid adjustment. This will be felt primarily in the US southwest and east through Texas, as well as Mexico. This is regarding new laws in the state of Michigan (with similar laws in Wisconsin, Indiana, Ohio and others). One link outlines the formation of Emergency Financial Managers (EFM's) who are appointed (not elected) and have "the ability to fire local elected officials, break teachers' and public workers' contracts, seize and sell assets, and eliminate services, entire cities or school districts, all without any public input". And adds "This decimation of local democracy is spreading". From the other link: "It's actually implementing emergency laws in place of the democratic laws". These measures, even if immediately implemented, couldn't possibly solve the economic problems before it's too late to matter anymore anyway. Don't these people know about the upcoming PS? Are these laws being implemented with any kind of good intentions and for the greater benefit of all (an STO plan-ahead outlook perhaps, to somehow be prepared for the true emergency to come)? Or is this just more STS scramblings before it all falls apart? A way to keep the people distracted, to help keep the cover-up in place? What are the motivating forces behind these new laws? What do these forces hope to accomplish at this late stage? Would the Zetas be willing to comment? Is the current wave of changes in the law, being enacted in many states with Republican governors and Republican controlled lawmakers, a factor of politics or a desire to slip into martial law? It is both. Where it does fall along the lines of political parties within the US, this is more a reflection of desire on the part of those who find the Republican party platform comfortable. Their personal views are that the those who have secured wealth and power should be allowed to hold it, and that they are probably superior in intellect and genetics to those who have not reached this stature. Laws that enforce decent wages or the right to collective bargaining are seen as an affront to this view. In the main, these legal changes are not strictly driven by knowledge of the coming pole shift, but certainly governors are tapped into a network of rumors that speak of the possibility of severe Earth changes. They are planning for the day when they will find themselves enacting a type of martial law, and to the extent that they can achieve their ends without having to take draconian steps and make their intentions obvious, are allowing changes in the law to give them more power. To what extent do laws giving a governor more power over civil servants help him herd the masses during catastrophes? How does this work? By threatening to terminate employment over large hunks of the populace, a governor can force compliance with almost any type of demand. Do this or else! Teachers may be forced to monitor children forced to garden and pull weeds. All in the name of budgetary reductions. I'm one of many (interior) architecture students, and I wish to know what Zetas can advise us concerning the status of architecture in the future pole shift and troubles and after time. Right now, we are told to think of "ecological - sustainable building solutions". But we still build aesthetic super "bling-bling" towers and villas full of objects. I believe the way of living, and philosophy of life has a strong link to the conception of a living space, and building. Less, more essential, less waste, the strict minimum. And so, mankind needs to evolve on that point. So, will us, future architects will have to build solid "catastrophe resistant" buildings, or "urgent housing" for people in need after the shift? More generally what should we keep in mind right now? Afterwards, will architecture be minimalist, and humble, or a combination of the minimum, essential yet nice and beautiful? What is the thought of the Zetas about architecture and its rôle? Or will architecture disappear in the 4th dimension? Will artists survive the pole shift? Will art regain it's essence and will exist after the big Shift? Zetans said music exists throughout the universe, in different forms, and tones, proper to each population and planet. I presume it's the same about art. What place does art have in the universe? Do Zetans like what humans do here on earth? Or do they consider art is not useful, that the nature is art in itself? Because here on earth, I believe art is what pulls human higher than all the mess he is creating, it gives hope, it uplifts the spirit. Yes, all depending on what type of art (dark or positive). What do Zetas say about this? You are struggling with these issues because you are not looking at the correct cause and effect. You see architecture and art as some sort of static thing, its current form, like a species that will die out. Architecture and art are an expression of the current living circumstances and emotions of a people. If the climate roasts under a summer sun, the shade an inviting friend, the architecture shuts out the Sun and creates an oasis in the home. In Norway, where the long and gloomy winter creates depression, interior design has developed into an explosion of color. Whatever the architecture or art forms of the future, it can be guaranteed to reflect the culture, the living circumstances, and the emotions of those living in those times. You need not try to get ahead of the issue, as it will arrive unbidden by you or anyone else. It is a function, not a force in and of itself. I've debated whether this is a worthwhile question to ask or not. And would quite understand with the growing pressure of the 7 of 10 cascading down on us that it would be declined. I've always wondered where the 4 blood types (A, B, AB and O) and the rhesus factors came into play in the human family. Some like the A and B blood types are quite rare compared to the O, yet they are resilient and survive. It is just a really interesting aside. Mankind searches for the missing link, the link between ape and man that shows that evolution made a smooth transition. The missing link is missing, as we have explained, because mankind's genetic engineering was primarily done on small islands or on the Moon in what was essentially a laboratory setting. The races of man that mankind is aware of are missing a couple versions that failed and were unable to sustain themselves in their environment. There were thus four races of man due to a different ape being used as the base, with a fifth ape in the mix from some interbreeding before Indonesia Man died out. Why do the blood types not line up cleanly with race, and why have human scientists discovered common genetics pointing back to a common ancestor in Africa? Where different apes were used during the genetic engineering of the different races, there were some common genetics used for all, and this includes the blood type variants. This is akin to man having hundreds of different cake recipes, but at base they all use egg and flour. Human scientists have discovered common genetics in all races, in every single human tested regardless of race or heritage. It is assumed that the common mother and father came from Africa, due to the age of various vestiges discovered to date. This is not true, as the common ancestor came from a LAB, as part of the base recipe. http://www.youtube.com/watch?v=UB4GAW6YOZA Look at this video, the way the alien is behaving and the people filming it just seem unlikely and ridiculous, yet the movements are astonishing and so close to reality in the way the Zeta's look. This seems to be from another country also which I understand the zeta's primarily assist those in the U.S. so I would guess it to be a fake but I was hoping I could get a direct answer to that question from them. Is this a real video capture of a gray? I understand there should be more and more captures of images of them as things progress. Though a well done computer generated animation, there are clues that this is a fake. What is the rationale for the filming? Why the close proximity to this supposed alien, who seem dumbfounded as it is caught in the light. The interest in aliens is natural given that many countries with solid evidence of the alien presence are opening their formerly secret files, allowing the public access to thousands of documented sightings. Where such interest exists, is it also natural for those wanting to spoof, or get attention, to generate fake videos. Thus this trend is unlikely to ease in the near term. Strange lights are appearing in the night sky in Colorado. These light tends to interact with each other and can move without a sound. Are these natural phenomenon or are there any hidden messages? These are clearly UFO displays, and as always signaling those below who are watching or attuned to telepathic messages. What is the message? Berthoud lies on the interstate connecting central Wyoming to Denver. Both are havens of the ultra right. Cheney has his retreat in Wyoming, and Denver is known to be the western White House, a future cesspool of political activity with Washington DC to be transferred there en mass as the pole shift approaches. What do the lighted lines in the sky of Berthoud symbolize but the traffic coming from both directions, none of it by friendlies. On Easter April 24, Kevin Smith posted on UFO Digest an ET contact disclosure from the National Security Agency purported to be space signals received by Sputnik and finally decoded by cryptographers after many years. The actual document is located at this link http://www.nsa.gov/public_info/_files/ufo/key_to_et_messages.pdf I would say it is not so momentous or awe inspiring as much as it is similar to Carl Sagan's gold disk put on the pioneer space flight. This brings up several issues. Is it real? Is it from STS or STO ETs? Is it meaningful to us in any way and if so, how? Why now? [and from another] http://www.ufodigest.com/article/official-et-disclosure-nsa-document-admits-et-contact-kevin-w-smith Dr. Campaigne focused on a set of information in a couple of the messages that turn out to be some mathematical equations. They also contain the listing of all the elements in our Periodic Table. I suppose those equations may make some sense to a physicist or engineer, but do not mean anything to me. I clearly understand how Dr. Campaigne came to the translation since he explains it very well. But, as to what the meaning of the equations are, I could not venture a guess. It is curious, though, that during his presentation Dr. Campaigne mentions there are "words" that they have translated, and some "words" they have not yet begun to understand. He gives an example of a connective word that he knows is connective (joining two or more statements) but does not yet understand the translation of that word. [and from another] http://en.wikipedia.org/wiki/Sputnik_1 Sputnik 1 was the first Earth-orbiting artificial satellite and the first man made object to be put into Earth's orbit. It was launched into an elliptical low Earth orbit by the Soviet Union on 4 October 1957, and was the first in a series of satellites collectively known as the Sputnik program. This was indeed a genuine message, though the world at large is first to hear of it because of the general cover-up over the alien presence. The Sputnik era came shortly after the Roswell incident, so both the US and Russia were well into enforcing a cover-up over the alien presence. The intel organizations of these and other countries have had an obsession with learning alien math ever since, as anyone who has consistently followed the ZetaTalk chats has discerned. There are persistent demands that Nancy speak math, and for the Zetas to explain how and why our math does not use the zero. The demands are for Nancy to examine human math formulas and explain what is wrong with them. All this has been refused under the guise that Nancy does not speak math well, and this happens to be true, but the real reason is that no assists would ever be given to the Service-to-Self among mankind who are behind these demands. Why would Sputnik issue what appear to be math formulas and words (all of which could not be discerned by mankind) and a clearly discernable Periodic Table? The Periodic Table was a teaser, as this could be readily identified. This set the Service-to-Self among MJ12 into a fever of trying to get contactees to speak math, to reveal what they might have learned. None of this ever succeeded and it was innocent enough, but it was the side benefit that these MJ12 representatives or their operative never realized. While they were focused on math formulas, they took their eye off the ball! The real action was not in math formulas, which were never going to be revealed, but in the Transformation, the spread of democracy, and preparing the Service-to-Others among contactees for the coming times when good hearted communities of survivors would dominate the Earth's landscape. NancyTalk: This is a true story. When my son and I first realized we were contactees we were in California, and sought a contactee support group. We contacted Bud Hopkins in NYC, did not hear back from Bud directly but soon were contacted by a former Navy officer in California who explained he worked the California area. We met for lunch and were asked a number of question and our telepathic abilities were tested. We passed. He informed us we were were genuine contactees, discerned by our answers to the questions. I have since read that certain characteristics of contactees are kept out of the press for this purpose, so they can be used as identifiers. We then located a support group in the area and attended the regular meetings. I was approached by a man and asked to lunch. To my surprise, he wore sunglasses even in the restaurant! Can't the CIA do better then this? Out came the math questions, followed by email demands that I, Nancy, try my hand at various math puzzles if we, the Zetas, were refusing to do so. It was the dominant theme. He kept demanding that I hand this over to the Zetas. Finally I did, though I knew they were refusing. Their words to this man, who constantly wore sunglasses, was "we told you we would not discuss math!". I did try my hand at the puzzle, though it was such a disaster, as expected, that I never heard from this man again. I know the zetas have said it is unlikely that martial law will be implemented in countries used to democracy. I remember there was a post by Chris Wakefield, regarding riot control equipment that was parked outside a Walmart in Washington State. Here is a film on what went on in the g20 meeting in 2010 at Toronto. http://www.youtube.com/v/zejD0UkMGGY Innocent ppl and bystanders were blocked off and cornered (not being allowed to leave) and mass arrested. The highest number of arrests ever to take place in Canada took place. Footage shows ppl who were dressed in all black (part of the group who perpetrated the violence), were actually allowed to go through the police line, while the innocent were unnecessarily treated like cattle. If you watch the movie, you see the conditions in which the ppl are incarcerated. All of this looks like practice for the times ahead. A "public parks act" was cited as the excuse on why police had the right to essentially do whatever they wanted. But this act was one that was enacted during wartime and was meant for times of war. There was a "420 event" in London, Ontario (Canada). This takes place every year attracting huge crowds. But this year for the first time, the cops arrested ppl, and the turnout turned out to be the lowest, because ppl were afraid of being arrested. I feel like these heavy hand tactics that are going to increase from here on. Could you please tell us how the elite plan on using these riot control equipment and when would do they plan on doing this? This is all so that the elite can get out of the cities? I would have thought they would have been outta the cities well before raucous broke out in cities. After this, are these kinds of tactics essentially to prevent ppl from spilling out of cities? Also can you comment on Canada as a hot spot for the elite? I have a funny feeling all of this is because Canada might be seen as an attractive spot for the elite, or perhaps Ottawa. The line crossed when the rule of law as enforced by the police to the rule of law when martial law is invoked is not black and white. It is a broad gray area, with many gradations. The laws allowing the police to control rioting is similar to the laws in place during martial law, in that people can be constrained, imprisoned, and held without charges or court hearings almost indefinitely. It is a matter of degree. Governments everywhere, on every level, will try to rely upon existing laws and the vigilance and loyalty of the police as long as possible. Invoking martial law will bring all manner of problems with it, as we have mentioned, in that those societies unused to these constraints tend to get paralyzed. Citizens stay home and are afraid to even go to their jobs, for fear or arrest and imprisonment. I was wondering what will be the major factor that results in so many people dying due to starvation after the pole shift. Is it purely due to a lack of food or is it because the people do not know how to find food in the wilderness or sheer panic and confusion prevents them approaching everything logically? How long do we need to wait inland after the poleshift before we can travel to the sea for fishing? I know the sea level will begin to rise after the poleshift but will there be more tsunamis after the poleshift and if so for how long? We have described our projection on how various groups will survive after the pole shift. Those in the cities will be starving when food distribution ceases. Those in the suburbs may learn to forage. If prescient enough to have started gardens, learning to save seed, and keeping chickens prior to the pole shift, they may not have to eat rats and weeds. Those along the new coastlines may learn to engage in fishing, provided they have boats and fishing equipment and the necessary skill sets. And rural areas inland will likely expand their existing production into those areas best adapted to the Aftertime gloom. Your question on why starvation will be rampant is thus best answered by the fact that half the world's population lives in cities, and food production in the remnants of the cities will be virtually impossible. Food distribution will halt. For those who think that foraging is the answer, the wilderness will only sustain so much. Wildlife will be hunted to the point of extinction. Not all vegetation is edible, and wild vegetation that is edible will be eaten to the point that there is little to find. Where bugs are edible, these too are not an infinite resource. Foraging will only work to preclude starvation if the number of survivors foraging are limited to what the area can sustain, and if the climate is such that long winters will not make foraging impossible for months at a time. Fishing along the new coastlines, which will move inland, will provide fish and kelp and seaweed for those who can get this into operation. But the majority of people moving inland away from the rising waters will not have the skill sets required, and they will often be in numbers that cannot be sustained by those who are successful in bringing food in from the oceans. Imagine a crowd of thousands of people picking up their tarp cities and moving inland, time after time, each time increasing in number. A boat returns with fish and seaweed, and is mobbed by the starving multitude. Thus in those locales close to where major cities were located, where the survivors are without skills and simply sit about waiting to be served a meal, even living on the coastlines will not prevent starvation. We have advised that those serious about survival move inland into rural areas not heavily populated, where farms and gardens are already in operation. They should certainly not simply live there, expecting to be fed, but get their own family operation going with gardens and if possible keeping chickens and goats or some similar herd of domesticated animals. If the land can support a fish pond, so much the better. Even moving to those rural areas where mass production of food is in process today will be of benefit, as when distribution to the cities ceases, there will be a surplus for survivors. Such areas will need many hands in the Aftertime, when fuel is gone so that mechanized agriculture is a thing of the past. Expect to work. Would you care to comment on the latest crop circle, appeared in Holland? It seems real. Somehow refering to PX position in the Solar System? This shows the passage of Planet X, from its entry into the solar system in 2003 to its turnaround to its second pass and thence to its exit from the solar system. As we have mentioned, Planet X adjusted its trajectory when it approached the solar system, to avoid particle crowding at the Sun's Ecliptic. It approaches the solar system at a 11° angle, inbound from the direction of Orion, dropping so that when it passes through the solar system it crosses at a 32° angle, and then returns to the 11° angle on its return trip back to its second foci. The large circles represent the two foci of Planet X - your Sun and the Sun's dark binary twin. The gyrations of Planet X during its dual 270 rolls is also shown. There is an interesting section in the ZT homepage called "Elite Exodus to safe locations" but unfortunately it's not been updated since 2004". Somewhere in ZT, the Zetas revealed that the European Elite plan to escape to the oil rich North Africa, as it will retain high ground and be placed along the new Equator. But now here comes the Big Surprise, the "2010-11 Arab Spring, a revolutionary wave of demonstrations in Tunisia and Egypt; Yemen; a civil war in Libya; Syria. Major protests in Algeria, Armenia, Bahrain, Djibouti, Iraq, Jordan, Morocco and Oman; and minor protests in Azerbaijan, Kuwait, Lebanon,Mauritania, Saudi Arabia, Sudan, and Western Sahara" (source wikipedia). 1) Is the European Elite's escape plan to North Africa still a valid option? 2) Is it true that in the Aftertimes the European Elite intends to take away from Gaddafhi, not only oil, but the Nubian Sandstone Aquifer System (NSAS), the world´s largest 'fossil' water aquifer system lying beneath the four African countries of Chad, Egypt, Libyan Arab Jamahiriya (Libya), and Sudan... covering some two million square kilometers, is the biggest future source of water deep enough to "bring a bread basket and a salad bowl to the entire middle east and most of Europe" for the next 1.000 years? Of course the elite in European countries are interested in the lands of Africa and its aquifers, as Africa will be almost entirely above the waves after the pole shift. France lept into Libya during the current protests, to assist the rebels, and this is not strictly for humanitarian reasons. They led the pack there, instituting bombing of Gadafi's troops almost before the ink was dry on the UN resolution. France will be devastated by the pole shift, as our description details, with water washing over the country from the Atlantic to the Mediterranean, and with Paris devastated. There sits Libya, just across the Mediterranean, with land aplenty, oil, and access to the aquifer! The elite in Europe are torn between supporting the old regimes and befriending the protesters. The protesters almost exclusively do not have identifiable leadership where the old regimes had clearly defined leadership, and had been in place so long as to be ossified. Now come the protests, with democracy in the offing, all of which destabilizes more than the old regimes. It destabilizes plans the elite may have put into place! Where migration at present is from Africa to Europe, this will reverse at some point, after the European tsunami, carrying with it many surprises. More to come on this another day! 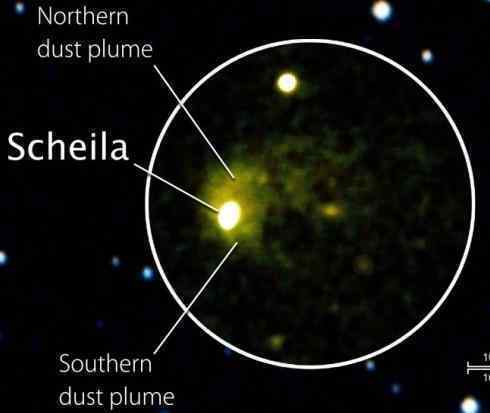 In December 2010, astronomers noticed that an asteroid named (596) Scheila had brightened unexpectedly. Not only that, the space rock was sporting some new and short-lived dust plumes. My question is as follows: Could this unexpected brightening of asteroid Schiela, and gaining of a tail, be Planet X related? Is this more lies from NASA? Recently, NASA offered the following explanation for this unexpected brightening. [and from another] http://www.examiner.com/education-headlines-in-baltimore/asteroid-collision Data from NASA's Swift satellite and Hubble Space Telescope unclosed the changes of an asteroid named Scheila that had unexpectedly brightened and was sporting short-lived plumes, likely occurred after Scheila was struck by a much smaller asteroid. "Collisions between asteroids create rock fragments, from fine dust to huge boulders, that impact planets and their moons," said Dennis Bodewits, an astronomer at the University of Maryland in College Park. Bodewits said this is the first time they've been able to catch one just weeks after the smash-up, long before the evidence fades away. This is a new ploy by NASA, set into motion some months past when NASA suddenly announced it had captured asteroid collisions. We stated at the time that this was to be one of their explanations for the Moon Swirls showing up on SOHO and Stereo images. The image they released at the time hardly looked like the Moon Swirl captures, and certainly did not look like the early photos of Planet X when inbound with its double helix dust cloud swirl trailing behind it. Now we have such images, pronounced by NASA to be merely asteroids! This is all to discredit ZetaTalk and the photos that Nancy and her team mates assembled over the years. Ah, they were just confused, it was merely an asteroid sporting a short-lived plume!